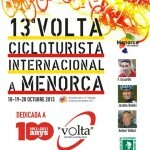 You may not have heard of the Tour of Menorca (Volta Cicloturista Internacional a Menorca to give it its full title) sportive but those who have been to the event will tell you just how good it is with many returning year after year to ride. 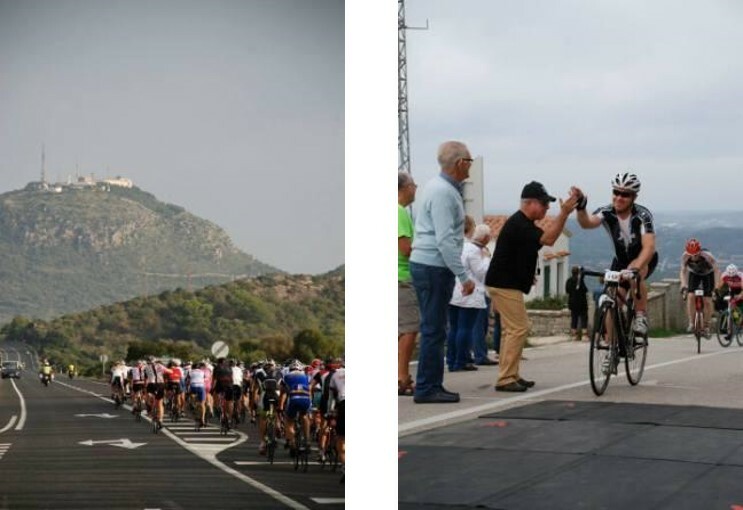 It’s a three day sportive on the Spanish Balearic Island of Menorca which takes place at the end of October each year, more often than not in warm sunshine. Good weather is not the only thing that attracts people back to this event year after year. Rolling road closures, well known former professional riders, excellent back up, good food, friendly riders, relaxed atmosphere and a chance to test yourself on the island’s highest climb Monte Toro all add up to an enjoyable weekend. This year was the 11th running of the event and over the years it has attracted some of Spain’s (and the world’s) top current and former professional riders. Tour de France winners Pedro Delgado, Miguel Indurain and Carlos Sastre as well as 2008 Olympic Road Race Champion Sammy Sanchez are but a few. 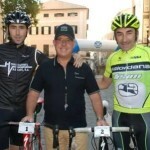 Former professional riders and guests of honour this year were Tour de France star Joseba Beloki, remember the guy who fell in the Tour forcing Lance Armstrong to go across a field to rejoin the race, and Fernando Escartin who finished third in the 1999 Tour de France. 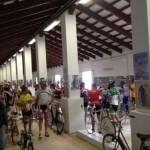 The Volta is based out of the island’s capital Mahon and the format for the event is as follows: a short 30-40km ride on Friday afternoon, 110km on Saturday and a 58km route on Sunday which includes the timed climb of Monte Toro in the middle of the island. Under Spanish law, the event must have a rolling road closure the whole way round so a lead car controls the speed of the bunch, this may seem restrictive but try keeping up with it on the rolling roads. This also has the added bonus of making you feel like a professional with all the motorbikes and convoy vehicles. Friday afternoon is always a spin out to a place of local interest and a chance for riders to meet and stretch their legs and make sure any hire bikes are all sorted. This year it was a short 45 minute ride out to a local vineyard. 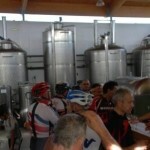 This is where the Volta differs from other sportives; riders were provided some of the local vino to taste accompanied by cheese and biscuits, not your normal ride food. We were soon rounded up for the ride back before anyone got too settled despite grumbles from some. Friday evening is when the event is launched with a presentation of all the pros taking part and a thank you to local dignitaries who make the event happen. A massive spread of local produce was also on offer from the famous Menorcan pastry ensaimadas, to savoury coques (similar to pizzas without the cheese) and plenty of local wine again. Saturday morning dawned a beautiful day and in shorts and short sleeves we left Mahon and headed out into the countryside in one big group, no two minute starting times here – everyone leaves together and stays together. We were soon on deserted back roads which were much more rolling than first appears but completely devoid of traffic. Heading towards the middle of the island, it was back on to main roads again but thanks to the rolling road closure traffic was held up for us, we say traffic but it’s just a few cars really and nothing compared to the UK. The pace went up and then it became obvious why as the first timed climb approached at S’Enclusa. It may not have been that long, about 1km but it certainly made up for it in gradient. Rolling back down and into the middle of the island we stopped for the day’s lunch stop at the cycle museum of the event’s organiser Arturo Sintes (Museo de Ciclismo de Menorca Arturo Sintes) in Es Mercedal. This is an impressive collection of bikes and accessories from the late 1800’s to the present day with quite a few rare pieces. Many of Spain’s top professional riders from many eras have visited and signed jerseys and photos for the collection. After a look round and some snacks it was back on the bike for the run back to Mahon. The run south was fairly flat and the scenery is stunning especially along the coast. We were soon back in Mahon and as the sun was out it seemed rude not to sit outside a cafe to enjoy the mid 20’s temperature enjoying some tapas and a few drinks. Sunday morning came around much too soon as Saturday afternoon turned into a bit too much cafe time and Saturday night a bit too much restaurant and bar time but you can’t not when the weather is this good in October (I’ve been going for five years and never learned to get over this). Anyway back to the cycling as Sunday is the Queen stage of the sportive. 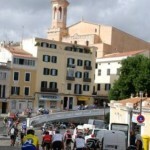 It may only be 60kms but it includes the timed ascent of the highest point on the island – Monte Toro. It may only be 358metres high but it’s only 3km long from pretty much sea level so it’s a lot tougher than it sounds. Coming into the climb the speed goes up as everyone wants to be at the front and when you hit the timing mat it just explodes. Knowing this climb well and having broken myself on it several times before, this year was about enjoying it so a steady pace got me to the top with a chance to enjoy the views across the whole island. After a quick water stop at the top, the descent on the closed road is great fun and you’re soon back on the quiet rolling roads to Mahon. The lumpy back lanes eventually take their toll though and by the time you reach Mahon you are thankful that it’s only 58km as for some reason your legs seem more tired than normal after three days riding. Everyone I spoke to felt this way so maybe we were all feeling the effects of a long season or too much cafe/restaurant/bar time as the whole weekend had a real end of term feel to it with no one in a rush to do much off the bike. 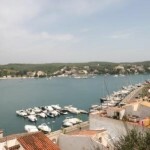 Tagged menorca, spain, sportive, Tour of Menorca, travel. Bookmark the permalink.